It is said that necessity is the mother of invention. A full pantry (thanks to inheriting the contents of a friend’s), a bad storm, and fresh vegetables made for the perfect condition to create something new. So create I did. This pasta is a great way to use and enjoy late spring/early summer’s best vegetables. Packed with flavor, fiber, protein, and healthy fats, it’s a hearty yet light one pot meal. Leftovers serve double duty as a pasta salad side dish. Believe me, the citrus, feta, and herbs play well hot or cold. I grew up thinking that pasta primavera was a vegetable pasta dish. It’s not far off, but ” primavera” just means “spring” in Italian. 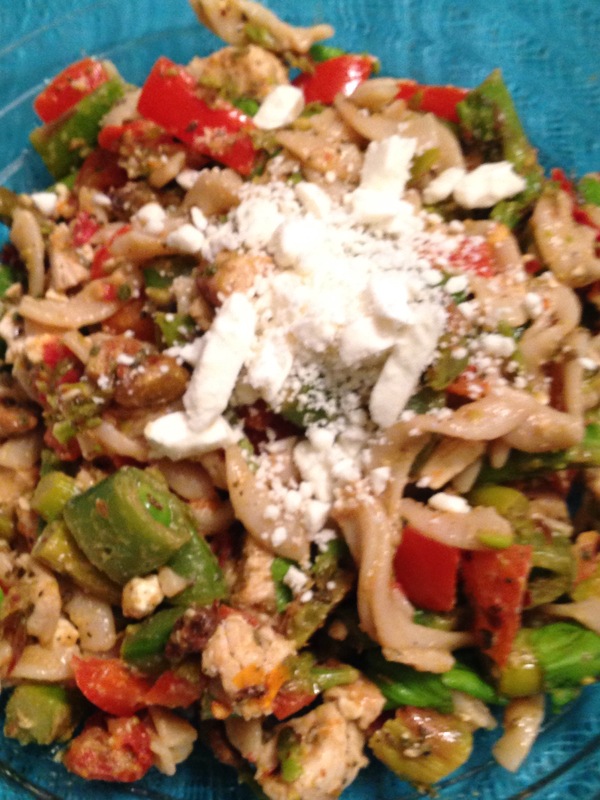 A good pasta primavera showcases seasonal spring ingredients. While officially it’s no longer spring, spring vegetables are in high peak in many areas, so take advantage of what you have on hand. I used what I happened to have in my kitchen, but you could easily use other vegetables. Adding 1/4 cup of diced Kalamata olives, substituting broccoli for the asparagus, or onions for the peas are other suggestions. Omit the meat to keep it vegetarian, or eliminate the cheese to keep it dairy free. I recommend using shaped pastas instead of noodles, as a small amount goes a long way and retains flavor. In this recipe, each cooked serving contains less than 100 calories (a half serving) of pasta. I used quinoa and brown rice fusilli, which happened to be gluten free and has a higher protein and fiber content than white semolina pasta. You won’t miss the starch with the bold flavors, colors, and textures of the vegetables, meat, and herbs. Roast the asparagus: Preheat oven to 425 degrees Fahrenheit. Wash and trim asparagus. Transfer to roasting pan (or 13X9X2″ baking dish) and toss with juice of 1/2 lemon and 1 tbsp. olive oil. Sprinkle with salt. Bake for 20 minutes or until asparagus is tender and stalks are bright green (heads slightly caramelized). Dice when complete. While the asparagus roasts, bring 2-3 cups water to a boil in a medium pot. Add pasta and cook al dente according to package directions. Drain, rinse, and return to pot; reduce heat to a simmer/low heat. Add remaining olive oil, lemon juice, and crushed garlic. Meanwhile, dice the red bell pepper and pea pods. In a small skillet, heat 1 tbsp. olive oil over medium heat and sauté for about 10 minutes, or until tender. Remove from heat and set aside. 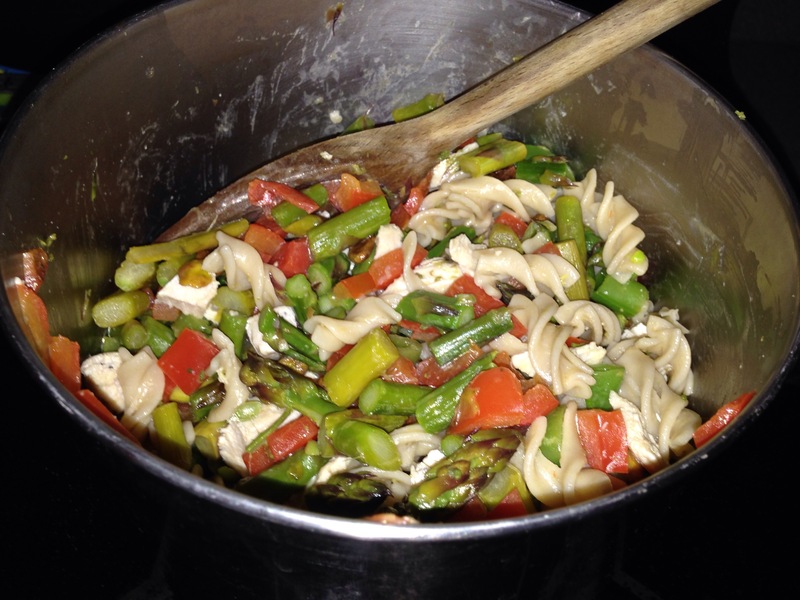 Add red pepper, snow/snap peas, asparagus, chicken, sundried tomatoes, and pistachios to the pasta. Toss to combine; add feta cheese, remaining spices, and salt to taste. Warm over low heat/simmer and serve. Garnish with additional fresh basil leaves and feta if desired.